The 3-, 6- and 12-month U.S. dollar (Eurodollar) LIBOR rates fixed lower today, while the 1-month rate moved higher. The 1-, 3- and 6-month U.S. dollar (Eurodollar) LIBOR rates fixed lower today, while the 1-year rate held steady at 1.58233%. The 1-, 3- and 6-month U.S. dollar (Eurodollar) LIBOR rates eased today, while the 1-year rate rose. The 6- and 12-month U.S. dollar (Eurodollar) LIBOR rates fixed lower today, while the 3-month rate rose. The 1-month rate held steady at 0.534%. The 1-, 6- and 12-month U.S. dollar (Eurodollar) LIBOR rates fixed higher today, while the 3-month rate was unchanged at 0.88178%. The 3-, 6- and 12-month U.S. dollar (Eurodollar) LIBOR rates rose today, while the 1-month rate slipped lower. The 1-, 6- and 12-month U.S. dollar (Eurodollar) LIBOR rates eased today, while the 3-month rate fixed higher. The 1-, 3- and 12-month U.S. dollar (Eurodollar) LIBOR rates fixed lower today, while the 6-month rate rose. The 1-year U.S. dollar (Eurodollar) LIBOR rate fixed lower today, while the 1- and 3-month rates rose. The 6-month rate was unchanged at 1.26228%. Why? Because of the U.S. Securities and Exchange Commission's (SEC) response to the severe financial-market turmoil that occurred during the worst of the 2008 banking crisis. On September 15, 2008, investment bank Lehman Brothers collapsed, and the Reserve Primary Fund, a large and now defunct money market mutual fund, which had much exposure to Lehman's debt, broke the buck. 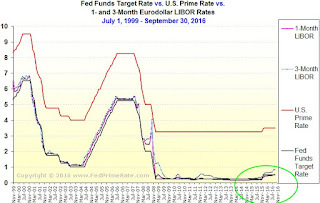 Will U.S. dollar LIBOR rates continue to creep higher after tomorrow? 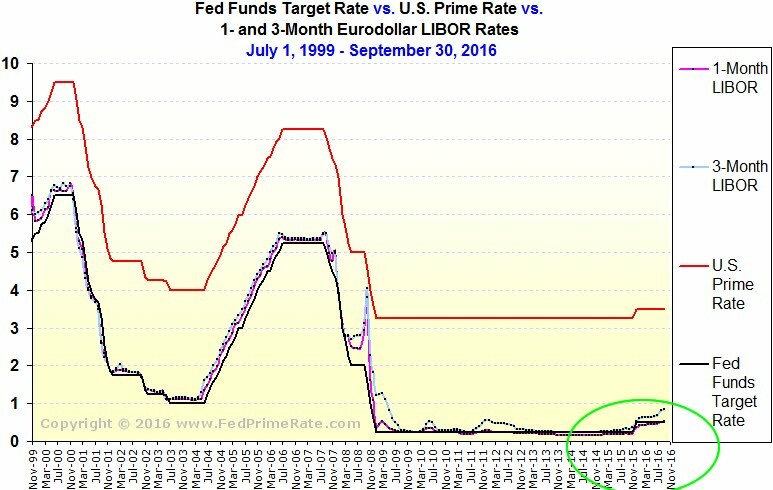 Probably, into December, because the likelihood of another rate increase by the Fed by the end of 2016 continues to rise. The 3-, 6- and 12-month U.S. dollar (Eurodollar) LIBOR rates moved lower today, while the 1-month rate held steady at 0.53456%. The 3-, 6- and 12-month U.S. dollar (Eurodollar) LIBOR rates fixed lower today, while the 1-month rate rose. Click here for historical Eurodollar LIBOR figures. Click here for USD LIBOR Charts.